June Passing of the Pioneers features the obituaries of several former Councillors, Mayors and a Mayoress. There are members of well known pioneering families and a man who died with no other relatives in Australia. There is also a Hamilton cricket champion who had the potential to play for Australia. William RUTLEDGE: Died 1 June 1876 at Farnham. 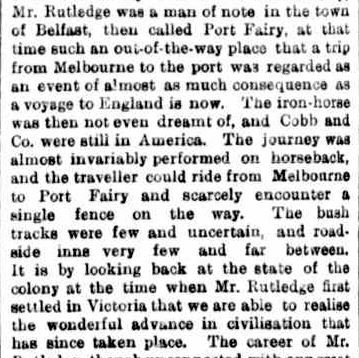 William Rutledge, born in Ireland, arrived in Sydney in 1833 aged around twenty-seven. After his marriage in 1839, he headed south to Queanbeyan, N.S.W. then Kilmore, Victoria in 1840. A visit to Port Fairy in 1843 saw him buy the business of John Cox and he transformed it into William Rutledge & Co, importers. He also selected a large amount of land at Farnham near Koroit. William also sat on the first Victorian Legislative Council in 1851 continuing until 1854. The Christ Church Anglican church at Warrnambool has a memorial window dedicated to the memory of William. A biography of William Rutledge (below) by Martha Rutledge in the Australian Dictionary of Biography tells of Edward Henty having referred to William as “Terrible Billy”. George OSBORNE: Died 14 June 1884 at Geelong. George Osborne was born in Sydney around 1809, his father a member of the 45th Regiment of Foot. George was a ship maker’s apprentice and worked on a whaling ship as ship’s carpenter. George first arrived in Victoria in 1840 at Portland. He then went to Melbourne before returning to Portland where he remained with his family. While he had lived in Portland for twenty-five years, after his wife’s death, George moved amongst his family members until his death. He was buried at the Port Fairy Cemetery. Eliza PITTS: Died 2 June 1914 at Edenhope. As an infant, Eliza Pitts travelled to Victoria with her parents aboard the Severn in 1846 and they settled at Wattle Hill, Portland. In 1860, Eliza married Richard Guthridge. They raised a family of six sons and six daughters. Son Frederick has also been a Passing Pioneer. In the early years of their marriage, Richard and Eliza moved several times between Portland, Mt Gambier and Carapook before settling in the Edenhope district. They were a well-respected family, renown for their longevity. Walter DISS: Died 3 June 1916 at Port Fairy. Walter Diss died with no relatives in Australia. He was born in London around 1851 and arrived in Victoria during the 1880s. He ran bakery businesses in Port Fairy and for a time ran the Exchange Hotel at Sale, East Gippsland. He returned to Port Fairy after the death of his wife, two years before his own passing. Ellen MALONE: Died 20 June 1916 at Killarney. Born in Queen’s County, Ireland around 1831, Ellen arrived at Portland in 1855 aboard the Caringorm. In 1856, she married Thomas Shanley and they settled at Killarney and raised seven children. At the time of her death, Ellen had forty-two grandchildren and six great-grandchildren. Robert WOOD: Died 27 June 1917 at Warrnambool. Robert Wood was born in Scotland in 1847 and arrived at Port Fairy, with his parents, aboard the Athletae in 1854. He farmed around Hopkins Point and Woodford before taking up a job as a storeman for R.H. Patterson of Warrnambool. He had a strong association with the Warrnambool Fire Brigade, serving as a member for forty-two years, twenty years of which he was the station keeper. Agnetta VIGAR: Died 24 June 1917 at Ararat. Agnetta Vigar was born on the island of Guernsey around 1831. She arrived in Adelaide in 1852 and married William Aggett. They moved to Ararat during the 1860s, settling on the Stawell Road. She left one son, Thomas, serving in Europe at the time of her death. John TWOMEY: Died 30 June 1918 at Lilydale. John Twomey was born at Banmore Penshurst, the son of John Twomey a pioneer squatter of the district. John Jr entered in the stock and station business and lived at Warrnambool. He was a member of several racing clubs and was a successful owner. In the years before his death, he moved to Melbourne then Lilydale where he passed. He was buried at Warrnambool Cemetery. John DOYLE: Died 8 June 1922 at Heywood. John Doyle was born in Tipperary, Ireland around 1842. He arrived in Port Fairy about 1856 with his twin brother and they set up a carrying business. John then bought land in Casterton before purchasing the Hamilton Inn at Hamilton. Tired of life as a publican, John bought land at Cape Bridgewater and Heywood and farmed dairy cows. He served as a Councillor with the Portland Shire. After the death of his first wife in 1877, he remarried. He left five sons and two daughters. A sixth son predeceased him. John’s twin brother died five weeks before at Hamilton. James GOLDIE: Died 4 June 1924 at Port Fairy. James Goldie’s death was tragic, but it should not take away from the contribution he made to Port Fairy. James was born around 1860, the son of John Goldie of Port Fairy. He was the first butter factory manager in Victoria, running a factory at Rosebrook. He later managed a large butter factory in N.S.W. James’ father, John Goldie tended his farm using the latest scientific practices. A photo of his farm is below. 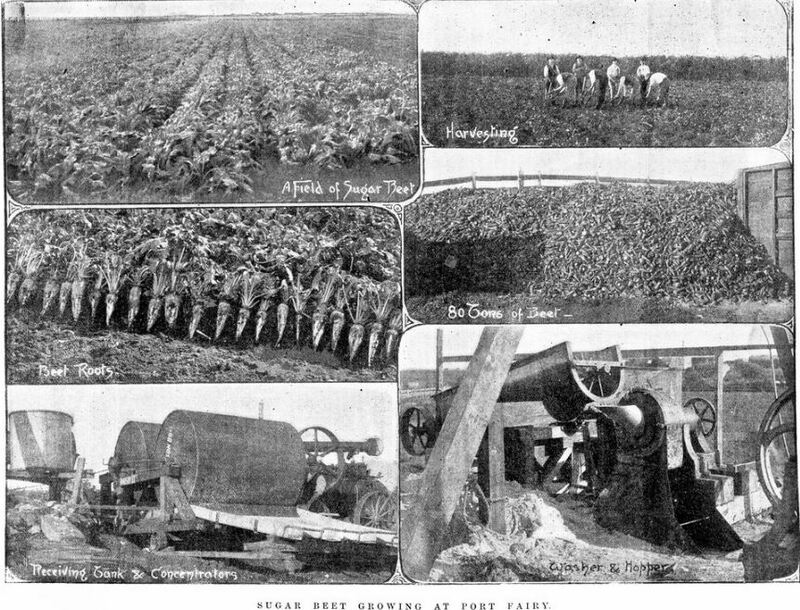 Taken in 1895, it shows trial crops of sugar beets. After John died, James took up part of the farm and became a respected breeder of Ayrshire cattle. James served on the Council of the Borough of Port Fairy with two terms as Mayor. He was also a member of the Agriculture Society committee and he was one of the men that established the Glaxo Milk Company at Port Fairy. Mary FLETCHER: Died 19 June 1942 at Sandringham. Mary Fletcher was born in Scotland around 1847 and arrived in Victoria as a child. Her parents settled at Goroke and in 1865 she married William Affleck. William passed away in 1867 and in 1869 she married James Wooton Shevill. 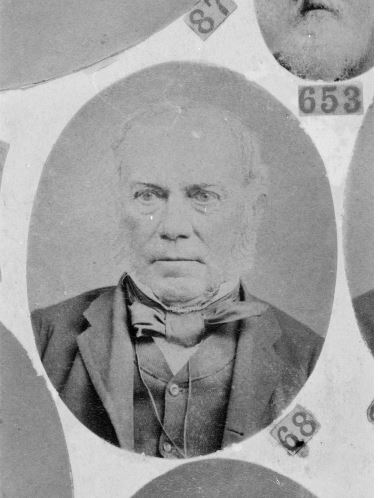 James was a Warrnambool Councillor from 1875-1878, holding the Mayoral role in 1877-1878. In later life, the Shevills moved to Melbourne. Peter DUSTING: Died 30 June 1946 at Melbourne. As Peter Dusting was the last surviving member of the family of John and Sally Dusting of South Portland, this obituary is more a Dusting family obituary rather than Peter’s. In fact, I was able to find little about Peter from it. He was born in Portland around 1866 and followed his father and brothers into the fishing business. Later he moved to Melbourne and remained there until his death. Emma Watsford TERRILL: Died June 1948 at Hamilton. Emma Terrill was born at Cape Bridgewater around 1880, the youngest daughter of Mr & Mrs George Terrill, pioneers of the district. Emma married William Jennings in 1905. William was the grandson of Cook Abraham Jennings and Hannah Birchall, also Cape Bridgewater pioneers. Emma was an expert on poultry and was often sought after for advice. After living all her life at Cape Bridgewater, two years before her death she moved into Portland. Emma passed away in the Hamilton Hospital. George KENNEDY: Died June 1950 at Hamilton. When I think of Hamilton cricket, I think of Kennedy Oval. George Kennedy is the man who the oval was named for. An obituary for George Kennedy in the Portland Guardian of 29 June 1950, suggests a decision by Melbourne born George to leave the city for Hamilton as a young man in 1905, may have cost him the opportunity to compete at interstate or even at international level. He played for the Grange club in Hamilton and excelled at both batting and bowling, the later his specialty. His talent was on display in 1912 when a touring English team played at Hamilton and George’s bowling figures where 3/35. After the match, the ball and a bat signed by the English team was presented by one his scalps, Sir Jack Hobbs, the most prolific scorer in first class cricket history. George was seventy-one at the time of his death. This entry was posted in Pioneer Obituaries and tagged Affleck, Aggett, Diss, Doyle, Dusting, Goldie, Guthridge, Jennings, Kennedy, Kennedy Oval, Malone, Osborne, Pitts, Rutledge, Shanley, Shevill, Terrill, Twomey, Vigar. Bookmark the permalink.